There are hundreds of free videos of quality out there on quilting (if you know where and how to look) and today's post is all about showing you some of the best sources on the web for improving your skill at the craft of quilting! One of our favorites has always been the Missouri Star Quilt Co. with their amazing instructor Jenny Doan. They come out with new videos on a regular basis, and if you subscribe to their YouTube channel, you will hear about each release when they present them. Their site QuiltingTutorials.com contains their videos and all of their other free resources for quilters. Jenny Doan demonstrates how to make a Jacob's Ladder quilt in this excellent instructional video. She walks through the process, step by step, in a way even beginner quilters can follow along. Don't forget to check out the other video resources we have for you below! 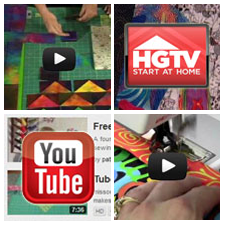 HGTV.com's Quilting Channel - This is an amazing resource with hundreds of video clips on just about any quilting topic! YouTube - If you know what you're looking for and put the right key words into a YouTube search, you can find a wealth of quilting gems here! Quilt-Video.com - Dozens of excellent videos categorized for you and very intuitively presented. This site is a tremendous resource for every quilter! Best Quilting Videos - A relatively new site that has some wonderful videos on a wide variety of quilting topics. Check this site out, it's one that's worth your while! Do you like Jenny's technique video? What do you think of this technique? Do you know of any other great places on the internet for quilting videos?